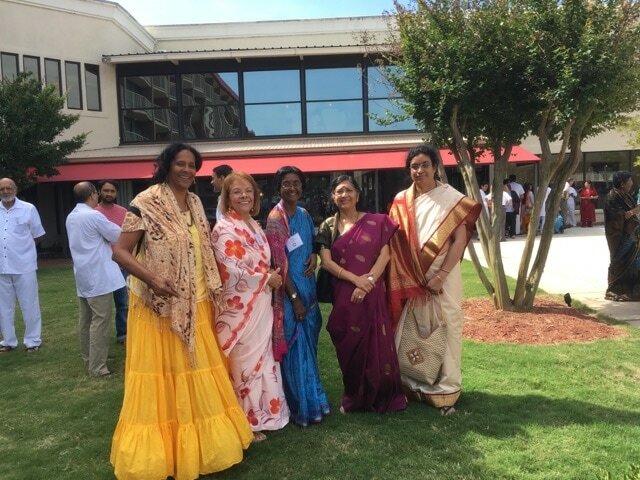 At the Sai Retreat, from left to right: myself, Yolanda D., Veena S., Getta Ram and Usha T.
a blissful celebration. The program entitled, Living with Values, Walking in His Footsteps, included guest speakers, workshops, early morning Omkar, Suprabhatam and Nagasankirtan. "You should go, you know how we love retreats." For some reason this struck my consciousness and I felt like Baba was speaking directly to me. Subsequently, I began making arrangements to attend the Retreat. "Identification with the Supreme is also possible for those who dedicate all (thoughts, feeling and actions) towards God, with an attitude of genuine contentment and total surrender." As I reflected upon this quote, I wondered how does one dedicate everything to God, intellectually we can say everything belongs to God, but to actualize this appeared vague to me. Friday, we rode up to North Carolina on a bus which originated in Fort Lauderdale, with a stop in Rockledge to pick up our group and another in Jacksonville. The bus ride was long almost nine hours but fairly comfortable and being with Sai devotees made the trip very sweet. "A man from my old Queens neighborhood had passed away some months ago and was in my dream. In the dream I was in a subway station, looked like New York City. I very clearly saw this man. There was another person there and we began interviewing him. I asked this man if he had any message for me to bring back. He looked at us and said emphatically "Continue continue continue continue!" Several times he kept repeating: "Continue". Then I realized the message was that we continue it doesn't end when we die, we continue. I think this was so significant, because this man had been skeptical about things of a spiritual nature. It was very apparent that he wanted to get this message back to the folks on Earth. We talked some more with him. I asked him how he liked the place where he was staying. He said in a very New York accent "Nah" and complained about some of the people there. There were other things discussed that I can't recall. But, I sincerely feel the main message he wanted to express is: We continue continue continue continue!" The highlight of the Retreat was main guest speaker Geeta Ram. She had the unique opportunity of being able to spend many hours in the company of Lord Sai Baba during the early years at Prashanti Nilayam. In her stories she describes the conditions and difficulties of traveling to Prashanti from Bangalore. Imagine a hundred mile trip took almost a day and a half, traveling by train, bus and bullock. But despite the hardships, the sweet, nectarine intimacy and association with Sathya Sai Baba was more than worth it. She was a young girl, about age 6 in the early years and recalled sitting on the Avatar's lap and conversing freely with Him. Swami nurtured her like His own daughter. He chose her husband and performed her marriage. All of Geeta Ram's wonderful stories and adventures contain valuable lessons for understanding the teachings Sathya Sai Baba and how to apply His guidance in our daily lives. The other guest speakers included Cosby Powell, Rommel Chitoori and Tom Lasanta. The SSE children did a walk for Values outside the Retreat Hotel, they also put on a presentation. The Young adults performed in a spectacular and inspiring drama. I would like to relate a few of Geeta Ram's anecdotes because they are so impactful and dynamic. Please forgive me for any paraphrasing and if I am not exact. This experience happened on Geeta Ram's 25th wedding anniversary. She and her husband were in New York City celebrating their anniversary. On this particular day they went to the temple and attended a Broadway show. During intermission, Geeta went to the Ladies room. There was a Spanish attendant in the room. The woman kept looking at Gita Ram. Finally she said, "You India? You know Sai Baba? You got Booti for me?" Geeta Ram discovered that the Hispanic woman had an 8 year old daughter in the hospital whose kidneys were failing. Every day the woman prayed to Jesus for help. She had no medical insurance. For the past four days she had experienced a recurring dream. In the dream she kept seeing a man with curly hair and an orange robe. He said, "don't worry I will take care and send an Indian woman to give you white powder, vibhuti" The woman asked, "who are you?" He said, "Sai Baba." Each day after the dream she looked for an Indian woman. On the fourth day, Geeta Ram showed up. The woman said "you have white powder for me?" Previously, when Geeta was in India, Swami had materialize vibhuti for her in an interview. Usually he would tell her to eat it on the spot. But, this time he carefully placed in in paper and folded it neatly. Geeta assumed it was for her husband who did not accompany her on this trip. But, when she returned to the states, she could not find the vibhuti which she had put in her purse, so she presumed it was lost. When the Hispanic woman asked her for vibhuti, which she usually carried, she looked in her purse and much to her wonderment the very packet of vibuti which Swami had manifested was laying in her purse. She gave the woman the vibhuti knowing that Sai Ma months go had intended this for her sick child. Both Geeta and her husband wondered what happened to that child and the following year in June they went to Prashanti Nilayam. Swami spoke to them and said, "How was New York?" "No kidney transplant necessary for that child." Another story by Geeta Ram helped me understand how to dedicate all my thoughts, words and feelings towards God. "why is that curly haired afro man following you all the time?" Geeta said that this child was so pure she could see Lord Sathya Sai Baba in His omnipresent form administering to her. She further elaborated, that if we involve Swami in every aspect of our lives we also can be blessed with the vision of Sai, just as this child had been. Geeta described how we can do this, I don't remember the exact example, but, for instance, if we are drinking tea we can ask Swami how he likes his tea, or if we are going for a walk, we can feel Him accompanying us and talk to Him, engaging in divine conversation. Geeta Ram says, True devotion is thinking of Swami. Whatever we do think of Swami. This way we cannot do anything that is wrong if we involve Sai in everything we do. For me, the main message I received from her wonderful talks is to involve Swami in every aspect of my life. This clearly answered the question I had about dedicating everything to God. She began her story with how all spiritual seekers in every religion realize the importance of remembering the Lord's name. Even if the name is not uttered the subconscious mind will remember God in times of duress. During this incident Swami had asked if she was coming to His 75th Birthday. She had responded that she was not. Swami remarked that it was because of duty, but that He would come if the devotees do their duty. On November 22nd, Geeta went to grocery and then to an ATM to take out cash. As she was reaching to retrieve her money she heard the back door of her car open and someone enter her vehicle. Suddenly a man put a knife to her throat and told her to drive off. Automatically and subconsciously she placed her thumb on a Sai Baba sticker she had on her dashboard. Many thoughts flew through Gita's mind, but at the same time she felt a surreal calmness. She wondered if after so many years of being at the lotus feet of Sathya Sai Baba, she couldn't have full faith in Him and believe He is with her in this moment, what a sheer waste of her time and His. Within minutes, several police cars drove up and surrounded her car. Calmly, Geeta said, "See I cannot drive, why don't you give yourself up." The man asked Geeta, "How come you're not scared?" Geeta replied, "My children are all grown up, no responsibilities." Again, Geeta encouraged the man to give himself up. Finally, the man said okay and was promptly shackled and arrested. Everyone cheered and the policeman lifted her up to show the burgeoning crowd that she was okay. Geeta found out later that he had escaped from prison. Meanwhile, back in Prashanti, Geeta's mother was in Darshan. Swami approached her and asked, "How is Geeta?" Her mother replied that she was fine. Swami then said, "Ahh, now she is okay." Geeta's mother became concerned due to Swami's reaction. Later, Geeta called her and related the whole incident. "Please thank Swami she told her Mom," brimming with gratitude. Swami had answered Geeta in triplicate. First he gave her calmness. Second the police came in two minutes time. Thirdly, He entered the assailant's heart and made him get out of the car. Geeta Ram says Swami encourages us to "Be Alert and Be Aware" This is an acronym for Baba. She went on to say how this state of alertness and awareness involves being conscious on all levels, physical, mental and spiritual. Being conscious of other people and helping those in need. Taking responsibility for ourselves and maintaining a good reputation. Also, as we start purifying our thoughts we start to see Sai in everything and everyone. Geeta Ram emphasizes that the whole purpose for coming to a retreat is so we can immerse ourselves in God and move forward. Swami's love is like the mother's love, more fragrant than a jasmine flower. Swami says His devotees are His children. We have to follow in His footsteps because we love Him.